Have you ever dreamed about becoming a shawl designer? You are not alone. Lots of shawl knitters dream of a design career, and about making a living from their knitting pattern designs. As somebody who achieved this – yes, I’m making a living from knitting – I’m telling you exactly what it takes to become a successful shawl designer. Shawl Design for Everybody is your free shawl design online resource covering every shawl shape you can possibly think of – including pattern templates, calculation how-tos, and tips for creating better shawl knitting patterns. This free tutorial on shawl design starts with the nuts and bolts of every design: Planning ahead. This means swatching, choosing yarn and needles, selecting a suitable shawl shape and the basics of calculations related to shawl design. We move on by diving deep into all shawl shapes and how they can be constructed. Please note: This article is in the process of being updated starting in January 2019. Updates will be finished by March 2019. Thank you for your understanding! The picture below provides an overview about the shawl shapes covered in this free online course. 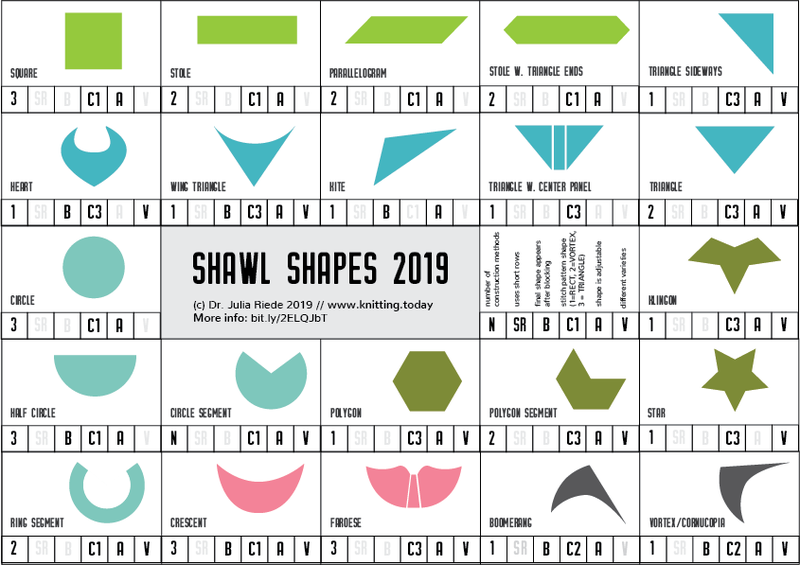 Here’s a PDF version for download: Shawl Shapes 2019. Did you know? Shawl Design in Plain English: The complete series on shawl design is available as PDF and on Amazon as Kindle and paperback editions. Find more information here! When will the Vortex shawls tutorial be released? Within this weekend I guess! Thank you so much for sharing such a wealth of knowledge. I am so happy about what I found on your site that I joined Knitting Today. You talk about all these different-shaped shawls and how to knit them: it’s all VERY helpful! But you don’t say anything about why one would this- or that-shaped shawl. How does each shape lay on the body and fall around the body? Where can we find THAT information so we know what shape we would knit for any particular situation or need? That seems to be the FIRST decision one would need to make BEFORE all the other decisions. thanks for your helpful advice! I’ll put this on my to-do list, I’m sure its worth thinking and writing about. I have quite a few shawls that i chose because of the texture or colour but many of them are asymetrical triangles. I dont like this shape as its hard to wear, falls off , etc. Have you any advice on how to adapt the pattern to, say, a crescent or (symetrical) triangle. I want the shawl to stay on my shoulders. Yes I do but not in a single article Im afraid. This topic is very complex and includes both resizing as well as reshaping. 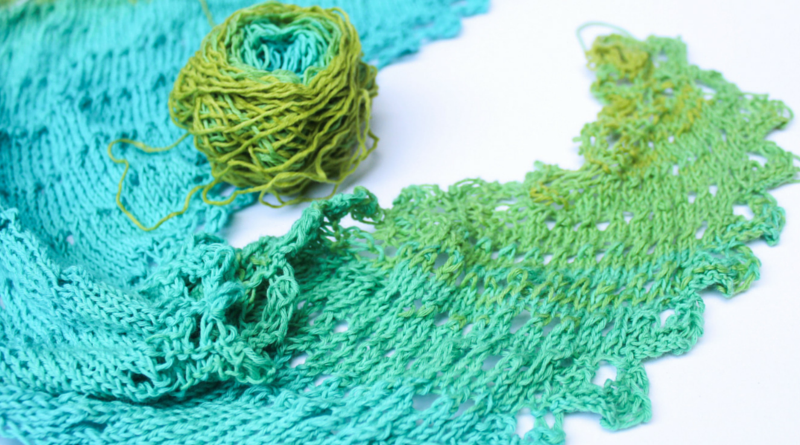 I wrote a whole book about reshaping lace shawls, it’s called Shaping Lace. I like Ked would find a discussion on the different shawl shapes use and wearability very helpful. Perhaps the community can pitch in with examples from different cultural traditions. For example, in Sweden we have something called a heart-shawl. It is triangular but not equilateral. It has long wings similar to winged triangular shawl in the shawl shape overview. It was worn by working women (and perhaps some men) who crossed the wings to the back and tied the wings together. That way it stayed on but was out of the way for work. I am sure there are similar traditions in other countries. Yes, there are. The Faroese shawl is a classic example! Wearability of shawls is on my list for a long time and will get its own post here soon. Thanks for the suggestion!